March 19, 2016 By This post may contain affiliate links. Here’s a great last minute idea for an Easy Easter Treat. Top white chocolate bark with lots of tiny marshmallows and cute little chocolate lamb heads to make Woolly Lamb White Chocolate Bark. I’m sure for many of you, like me, the Easter holiday has come upon you too fast. When Easter is in March there just isn’t enough time to get as many fun treats made to share with you as I’d like. I am always scrambling to get all my chocolate orders completed and, when the holiday is early, more customers call at the last minute in a panic. Oh, well, for this year anyway, we are all rushed, so I have come up with a super cute and easy Easter treat that you can make in about 20 minutes. 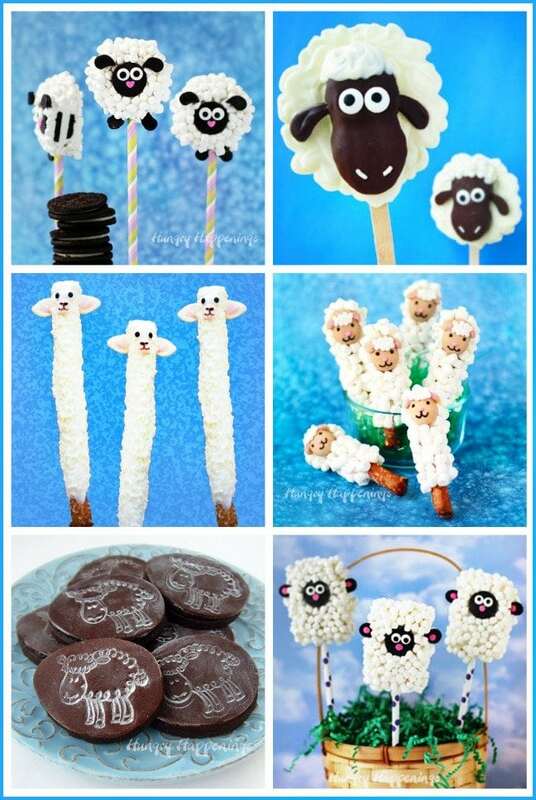 Yesterday, I shared with you some adorable Oreo Lamb Lollipops that I made using white chocolate dipped Oreo Cookies topped with tiny marshmallows and chocolate lamb heads. They are pretty simple to make, but not nearly as easy as this Woolly Lamb White Chocolate Bark. 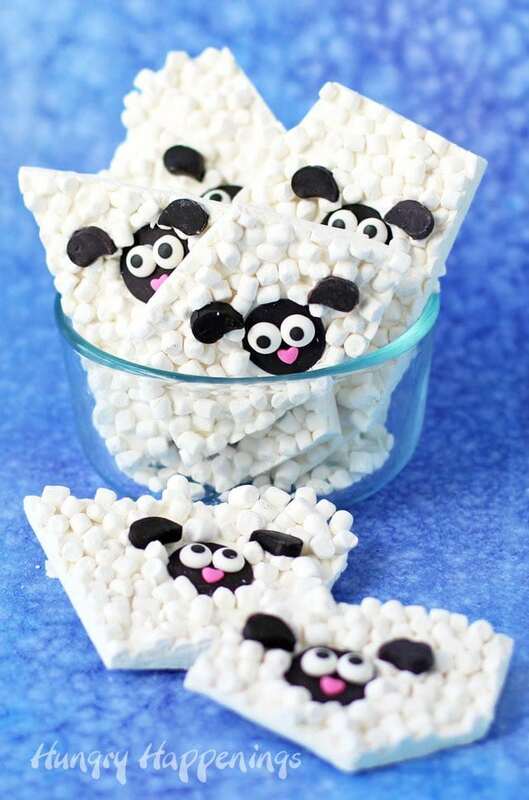 While I was making the Oreo Lambs, I had some left over white chocolate, and just for fun I spread it out onto a pan, added a few candy wafer lamb heads and tossed on some tiny marshmallows. This simple white chocolate bark, while not quite as cute as the dipped Oreos, was still pretty darling. I just had to share it with you. You can make this chocolate bark using melted and tempered pure white chocolate and use dark chocolate callets to make the lamb heads or you can use white candy melts and black candy melt wafers. You can find detailed information about choosing and melting chocolate or candy melts on my Chocolate Making Tips page. To make the lamb heads, attach two candy eyes and one pink heart sprinkle nose to the flat side of a chocolate wafer using melted chocolate. If you find the wafers have white scratch marks on them, rub them against the palm of your hand to remove the scratch marks. Use a 1/2 inch long tear drop cutter to cut tiny ears out of chocolate wafers. If you don’t have the tiny cutter, you can also pipe small tear drop shaped ears onto a parchment paper lined baking sheet, let them harden, and pop them off to add to your bark. Reserve about a tablespoon of white chocolate for later then pour the rest onto a parchment lined baking sheet and spread it into a thin even layer. Immediately and quickly press lamb heads around the white chocolate. Leave plenty of room around the lamb heads. I only added 9 lambs to my tray, but I think 12 would have been better, so that’s what I have written in the recipe below. Once you have all the lamb heads on the white chocolate, toss on lots of tiny marshmallows. I used Jet-Puffed Mallow Bits. They are dehydrated mini marshmallows that you can find in plastic tubs at the grocery store, either near the hot chocolate mixes or near the marshmallows. Let the bark sit for about 5 minutes, then cut it into pieces. Pop it in the refrigerator for 5 minutes then remove it and use the reserved white chocolate as glue to attach the lamb’s ears to the white chocolate bark. 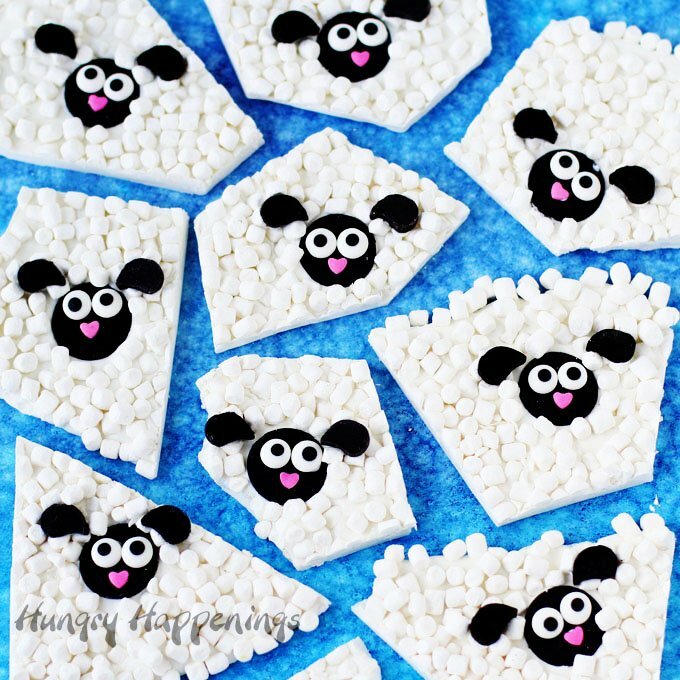 Press them onto the marshmallows so the ears are on either side of the chocolate lamb heads. In no time at all you’ll have a great Easter treat to share with friends and family. You can put your festive chocolate bark in a candy dish, serve it on a plate, or package it in bags or boxes to put into your Easter baskets. If you do make this ahead, it will stay fresh in an airtight container for more than a month. White chocolate bark topped with lots of tiny marshmallows surrounding chocolate lamb heads. 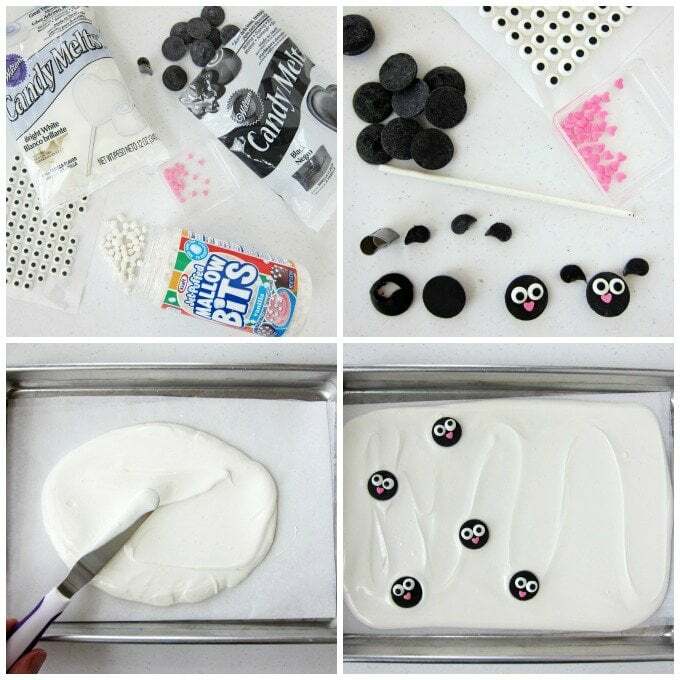 Attach two candy eyes and one pink heart sprinkle nose to each of 12 black candy melt wafers using the melted white chocolate. 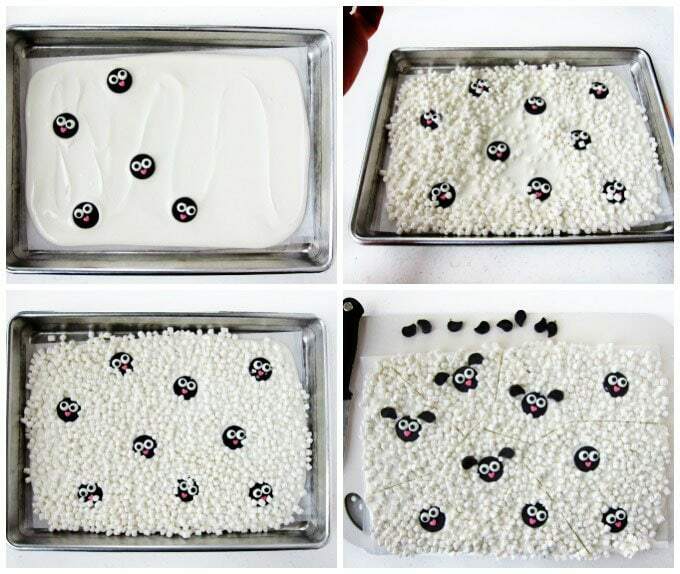 Cut two small tear drop shapes out of each of the remaining 12 black candy melts. Reserve one tablespoon of the melted white chocolate for later use then spread the remaining white chocolate in an even layer on a parchment lined baking sheet. Press 12 chocolate lamb heads onto the white chocolate, leaving plenty of room around each. Sprinkle tiny marshmallows all over the white chocolate. Let sit for about 5 minutes until the chocolate sets soft, then cut the chocolate into bark pieces. Refrigerate for about 5 more minutes until the chocolate sets hard. Use the reserved white chocolate to attach two candy ears on either side of each lamb head. Let the chocolate dry, and the bark is ready to serve. How cute! 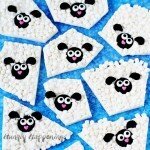 I adore these adorable sheep!